The long-only strategy (STM L) is performing 1.7 times that of the SP-500 buy-&-hold whilst the long and short strategy (STM L+S) is performing 3.1 times that of the SP-500 buy-&-hold since January 2009 (latter part of 2007-2013 out-of sample period.) Both models under-performed the SP-500 for September & October since they were in cash when the SP-500 rose in these months. This is a quantitative actuarial trading model for the SP-500, using purely multi-annual cyclical historical seasonal statistics to govern if it is invested in the market or not. There are no traditional technical metrics used (moving averages or market breadth) nor are any econometric models deployed in the seasonality determinations. The model is actually a pair dubbed STM-L (Seasonality Trading Model longs-only) and STM-LS (Seasonality Trading Model – longs and shorts.) Both models deploy two-times leverage on rare occasions when the statistical algorithm deems probabilities to the upside (or downside) to be highly favorable and move into cash when the statistical outcomes appear uncertain. For now, the specifics of the parameters used by the algorithm remain proprietary. Apart from stunning returns predictions, we have another interest in the STM model and that is its remarkable ability to rely purely on seasonal factors to accurately forecast bear market and recession risk. The main reason STM outperforms the buy-and-hold is that it manages to avoid the worst of almost all significant market downturns since 1957. The fact that none of the seasonality metrics used in the heuristic algorithm are subject to any revisions, makes this even more attractive. Up until now we have been expanding on traditional econometric methods to improve our forecasts and probability measurements of recession, but now we are beginning to understand the important role seasonality can play in enhancing this endeavor. The fact that research on the use of seasonal methods to forecast recession is relatively new (and undocumented) makes this all the more rewarding. This is of course our main interest, with the market timing benefits secondary. In the long-only strategy, we are in cash when the STM signal is below +0.5 and in un-levered SP-500 long positions otherwise. The total return (TRI) is simply the re-invested growth of $1 since 1957, excluding transaction costs, dividends or interest received whilst in cash. Besides a high winning rate, the other important metric for any trading system is the gain/loss ratio (also known as the risk/reward ratio) which shows how many winning points there are in all the winning trades divided by how many losing points there are in all the losing trades . Strong short-term trading algorithms require at least a 3 to 5 ratio whilst investment models should be at least 10-to-1 or more. The above chart shows us that gains and losses are evenly spread and not tilted to any one historical decade nor changing in any discernible trend. This type of repeated consistency is important in long-run historic models. Also of importance to us is how the gains and losses are distributed, which is shown below. This has all the hallmarks of a good trading model. Much more green bars than red bars and much taller green bars than red bars. Small number of losses and winners swamping the losers in size. Remember, all these returns are with no leverage. The fact that over a long time horizon of multiple business cycles, we can consistently out-perform the SP-500 by a factor of 37 times, with no leverage and for only 55.6% exposure to the stock market (in cash for 44.4% of the time) is truly remarkable. 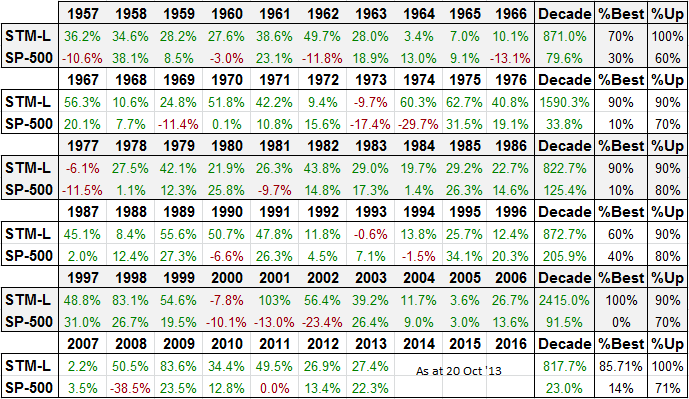 The table below depicts yearly returns through the decades compared to the SP-500. While STM does not consistently have more positive years than the SP-500 (% Up column) nor consistently has more better years than the SP-500 (%Best column), she consistently has far less large negative years and this is primarily responsible for the huge out-performance of the buy and hold. The statistical distribution of the monthly SP-500 un-levered returns on the 114 Power Months encountered by the model since 1957 is displayed below. Just double the returns in the chart to get a view on the actual leveraged returns the model would have been making during the “Power” months in question. The most notable introduction of unwanted additional draw-down as a result of leverage is 1978, but this is the only instance of significantly more undesirable results. An important note on rolling draw-downs – the above and below charts only consider rolling 12-month windows whilst in many instances bear markets can last up to 18 months. What both of the above charts show us is that the maximum draw-down on the STM (un-levered) was 15.7%, the maximum on STM (levered) was 15.8% and the maximum on the SP-500 buy-and-hold was a stomach churning 47.5%. Also, the fact that virtually every SP-500 bear market was accompanied by dramatically lower draw-downs for the seasonality model proves beyond a shadow of doubt that periods of protracted poor performances on the U.S stock markets have a statistically significant seasonality factor associated with them. 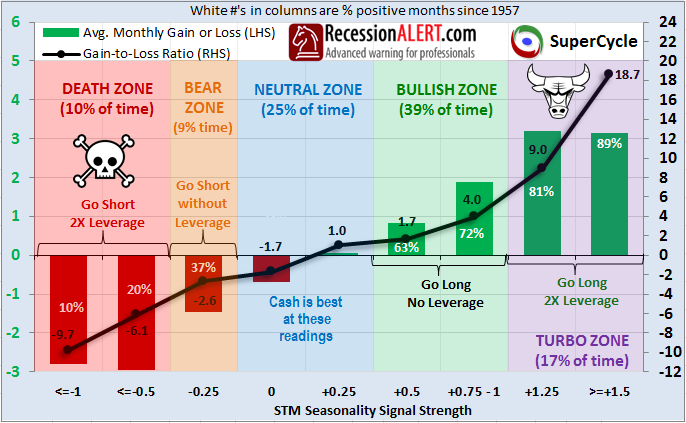 From the Seasonality Signal Strength table in Section-1 we see that it is statistically worth your while shorting when the STM signal is less than or equal to -0.25. In fact, when the signal is less than or equal to -0.5 it becomes a compelling case for using leverage on the short since these months are characterized by losses more than 80% of the time and winning points on your trades will exceed losing points by a factor of 6-to-1 or more. The lower the STM reading, the more compelling the statistical case is in favor of shorting the SP-500 and thus the more viable it is to introduce leverage. 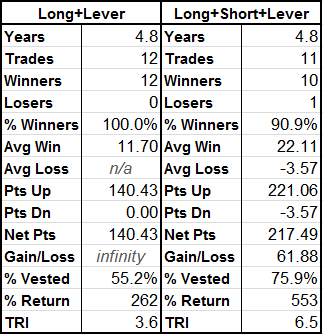 The statistics below show how the introduction of shorting to the “Longs-only with Power Zones” strategy actually reduces risk while boosting returns. This is most notable in the substantive improvement in the overall gain/loss ratio of the strategy, which almost doubled. It is important to note that shorting on its own, whilst a viable and profitable strategy, only has a 72% win rate and a 8:1 gain loss ratio. However, the introduction of shorts together with the long positions that make up a single continuous multi-month seasonal trade is where the magic happens, since if a short goes wrong, the overall gains on the long trades will absorb the short losses, and vice versa. The above chart is updated daily for our subscribers in the live CHARTS menu, and shows how, as at 20 Oct 2013, the long-only strategy had out-performed the SP-500 by 1.7 times and the long + short strategy by 3.1 times. The thin dotted lines are simply the equity of the timing model divided by that of the SP-500 to figure out how many times the model has out-performed the buy-and-hold. When the dotted lines move up, it means the timing model is out-performing the buy-and-hold, and when the dotted lines move down, it means the timing model is under-performing the buy-and-hold. We need to see the dotted lines going up more than they are going down, and showing a rise from bottom left to top right of the chart, otherwise the timing models are not worth the effort. The individual trade statistics for the above period are shown below. It would be safe to say that both strategies are out-performing model expectations from a gain/loss and win rate perspective, considering the SP-500 returned a TRI of 2.1 or 112% gain versus the 262% and 553% gains shown in the table. Whilst a return of 262% from STM-L versus 112% from the Buy-and-Hold may not seem like much to write home about, we must take cognizance of the fact that STM-L was only invested in the stock market 55.2% of the time! If we were to adjust the STM return to take it to the comparable risk of 100% market exposure of the buy-and-hold model, then STM-L would deliver 262/55*100=476% return for equivalent buy-and-hold stock market exposure. We will now examine the performance of the STM model in relation to the SP-500 buy-and-hold and past recessions and bear markets. The first example covers the Great Recession. We see the SP-500 experienced a peak-to-trough draw-down of 52.6% whilst both STM derivatives only drew down 14.7% peak-to-trough. 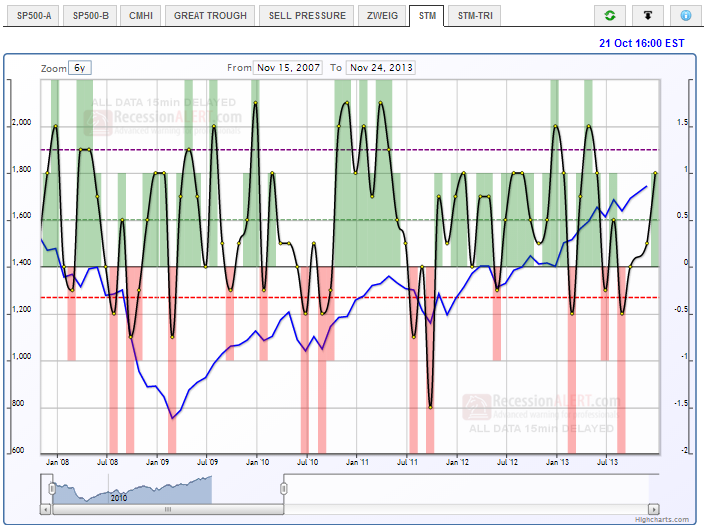 Almost every known documented seasonality model suffered in the 2008 crash but STM suffered minor abrasions. At the end of the day, STM emerged from the recession with substantially more money in the bank than the buy-and-hold having withstood far less gut-wrenching draw-downs. Now look at the 12-month moving average of the SP-500 which would have kept us very nicely out the recession and getting us back in right after the recession ended. Whilst the moving average would have skirted the losses made by STM-L it would have missed the large trade in the trough of the business cycle. This is common with moving averages (they get back in too late) and impairs returns substantially since the first few trades in a business cycle trough are typically where the bulk of gains are to be had. Below is the 2000 to 2002 bear market and 2001 recession. 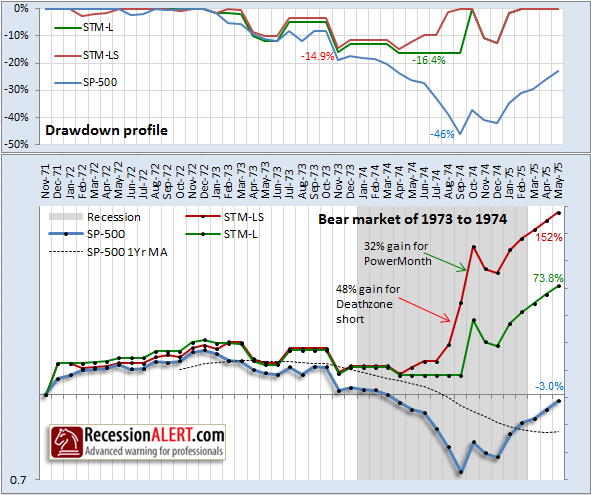 In this case both STM models excelled over the buy and hold, climbing during the course of the bear market and experiencing negligible draw down. Again, we see the 12-month moving average of the SP-500 monthly prices would have kept us neatly out of the bear market, but it was a complete laggard in getting back in again, missing gains of 19.5% before climbing back into the market. In this example the STM comprehensively outperformed the moving average strategy. 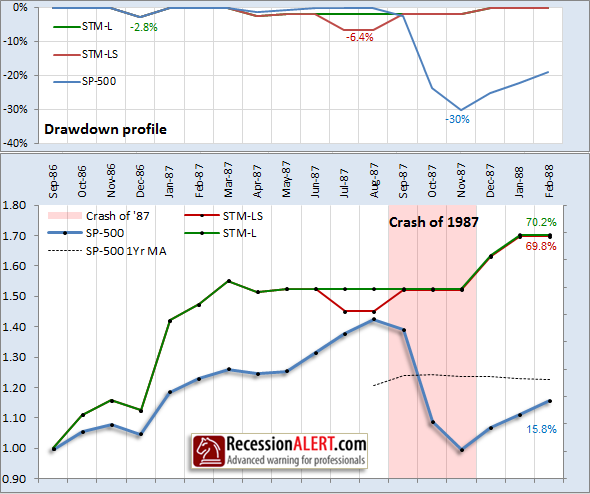 We now look at something different – namely a crash as opposed to a bear market or recession. Black Monday refers to Monday, October 19, 1987, when stock markets around the world crashed, shedding a huge value in a very short time. The crash began in Hong-Kong and spread west to Europe, hitting the United States after other markets had already declined by a significant margin. Potential causes cited for the decline include program trading, over-valuation, lack of liquidity, and market psychology. But what does not get spoken about a lot is that this time period ranked poorly from a seasonal period. Whilst the lousy seasonality itself was not responsible for the crash, it left the US markets vulnerable and thus an exogenous shock was compounded by the unfavorable seasonality. We have found very few technical-oriented macro-market timing models that managed to skirt the Crash of ’87 (the crash and subsequent rebound were too rapid) but STM sailed right through it as shown below. As you can see, the 12-month moving average of the SP-500 got out the market when the worst was over and then proceeded to miss out on the subsequent rebound – a real double whammy. STM started staying clear of the market 3 months before the crash and also nailed the bottom entry perfectly. Let’s get back to recessions with the 1974 example below. 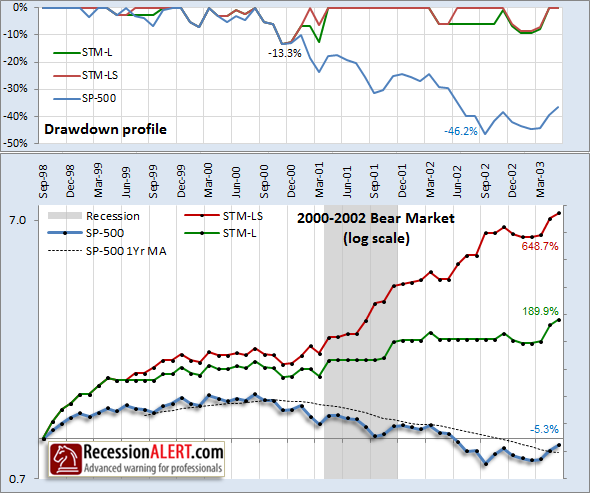 As with the 2008 great bear market, STM experienced one-third the peak-to-trough draw-down of the SP-500 whilst entering the new economic expansion with considerably more funds in her equity account that the buy-and-hold investor. The 12-month moving average of the SP-500 again got us deftly out the way of the bear market but got crucified by missing out on about three-quarters of the rapid 49.9% market rebound. You will also see that we had a Death-month followed straight after with a PowerMonth which considerably boosted returns of the STM L+S strategy. Note how the STM models nailed the bottom entry perfectly. 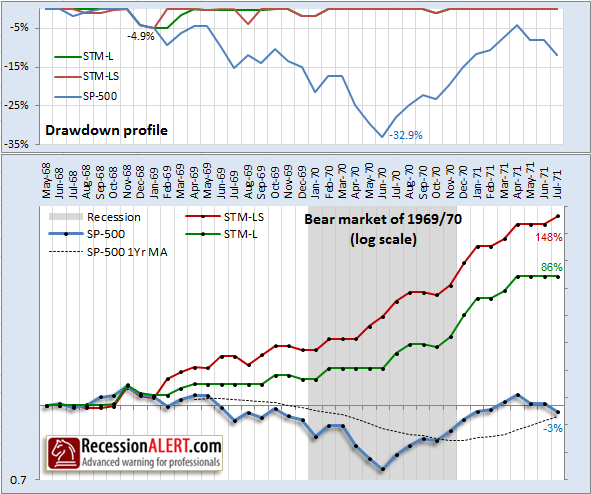 The final bear market we cover in detail tells much the same story – agonizing 32% draw-down for the SP-500 and only 4.9% for the STM models. Again, the 12 month moving average appears to allow us to skirt the bear market but is tardy in getting us back in again on the sharp rebound. The STM models enters the new business cycle expansion with equity accounts considerably larger than the buy and hold investor. We have covered 5 large corrections in detail but there are approximately 9 in total since 1957 that all tell a very similar story. The fact that virtually every SP-500 bear market was accompanied by dramatically lower draw-downs for the seasonality models proves beyond a shadow of doubt that periods of protracted poor performances on the U.S stock markets have a statistically significant seasonality factor associated with them. Lest you let the above charts tempt you to run your investment program on a 12-month moving average of the SP-500, be warned that such a strategy delivers only 1.4 times the performance of the buy-and-hold at best as it suffers from false alarms (whipsawing) and late re-entries that significantly impair overall long run returns. The charts we showed you of the big bear markets paint the moving average in a very good light. Whilst it is true that every recession was presaged by a dip of the SP-500 below her 12-month moving average the converse is not true – i.e. 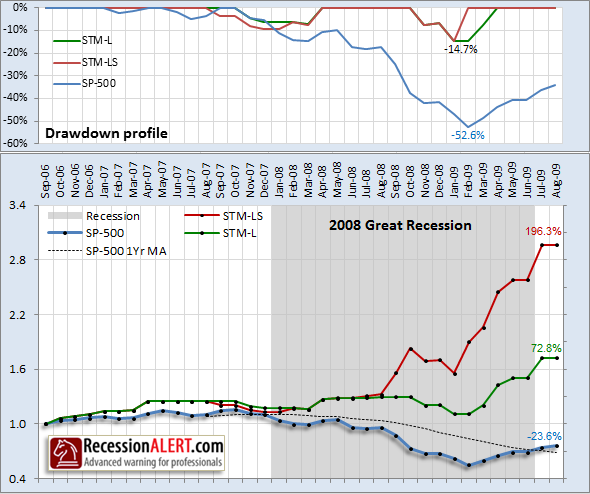 every dip of the SP-500 below the average did not result in a recession or bear market! The “Power Months” occur only 17% of the time but are truly not to be missed since over 85% of these months land up being positive on the SP-500 with an average un-leveraged gain of some 3.2%. But what is more important is that the cumulative percentage points of all the positive months were over 12 times more than the cumulative percentage points for all the losing months! This gives a risk/reward ratio of over 12 times, meaning for every percentage point you lose in one Power Month, you will claw-back 12 on a subsequent Power Month! This is why we recommend a 2-times leveraged position to take advantage of this high positive expectancy during these periods. Also note that whilst a great deal of the returns of the seasonal strategy come from trades conducted during the “Bullish Zone” months you must note that a sizable chunk of the months (some 32%) lead to losses, sometimes of up to 10%. This is why we call seasonal strategies “blunt instruments” – they are never perfectly right all the time but if you stick with them long enough they are mostly right and the returns of the right trades will eventually swamp the losses of the wrong trades (by a factor of 2.8-to-1 as the chart shows.) This is why you should not be the least bit surprised if the model shows a bullish month and it lands up being a negative month. Pinpoint month-by-month accuracy is not the objective here – this is a game of attrition – and with the odds on your side, provided you play long enough you will come out ahead. Do not let the losses in the Bullish Zone chart concern you – remember, this chart shows the distribution of individual SP-500 monthly returns, which from a STM trade basis is not really of your concern since most STM trades will consist of 2 to 6 months strung together. That is why individual STM trades, composed of many months of various seasonality signals have an expectancy of over 80% and 28:1 gain/loss ratios. With regards the “Bearish Zone”, it is interesting to note that the statistical expectancy (%win, gain/loss ratio) of these months to the downside is almost identical to those months to the upside for the “Bullish Zone”. Thus you have equal odds making money on the shorts in one particular month as you have making money on the longs in a bullish month. The “Neutral Months” are interesting. They are an equal mix of very negative and equally positive returns. There is a slight statistical negative expectancy on the left hand chart below (when STM=0) and almost no statistical expectancy on the right chart below (when STM = +0.25) – and that’s why the model prefers to stay in cash. Again, the distribution of SP-500 un-levered monthly returns during periods when the STM model is showing a “0” or “+0.25” signal shows that there is an almost equal probability you will count your blessings for dodging a huge correction or curse your luck for being in cash when the market rallies hard. The reason cash is preferred in the neutral state is that if the market corrects hard, then you’ve avoided some losses, but if the market rallies hard and you are in cash then all you have lost is opportunity and not real hard cash out of your trading account. There is a difference! In the absence of any desirable statistical expectancy either way the model plays it safe and tucks away in cash. Do not confuse the neutral zone with neutral returns on the SP-500 – on the contrary returns can be volatile -and in any direction- during these periods, as shown on the above charts. It’s just that in the absence of compelling odds in our favor (from a purely seasonal sense) for shorts or longs, we take the safe route to cash to fight another day. The various ways you can execute the STM signals are shown below. The “Long-only” strategy goes long when the signal is >=0.25 (but uses no leverage) and is in cash otherwise. The “Long+Short” does the same as the “Long-only” but also shorts when the signal is less than or equal to -0.25. 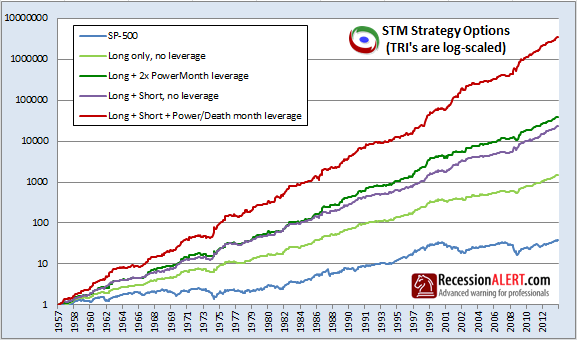 The leveraged strategies deploy additional 2x leverage whenever the STM signals a PowerMonth or a Death Zone month. Note how the longs-only strategy, deploying leverage during the high-confidence Power Months actually beats the longs+shorts (un-leveraged) strategy. This is the recommended strategy if you are unfamiliar, uncomfortable or incapable (due to your fund mandate) of shorting the market. The STM strategy is live on the CHARTS menu for subscribers as a separate menu-tab “STM” next to the SP500 Market Timing Project , CMHI, Great Trough, Zweig Redux and the Selling Pressure tabs. It will provide a daily update of the SP500, the STM signal looking forward 6 months (the example below only shows 1 month forward), the projected returns as well as all LONG/CASH/SHORT and Power signals in a rolling 6 year window. Tall green shading (+2) indicates Power Months, shorter green shading (+1) indicates normal long months, normal red shading (-1) indicates shorting months and tall red shading (-2) indicates Death-zone months and no shading (0) represents months in cash. Hovering your mouse over any month will raise a tool-tip on the screen with the actual values for STM signal, SP-500 and the suggested position you should be taking. You can also click on the round blue “i” icon for more help when viewing the chart. 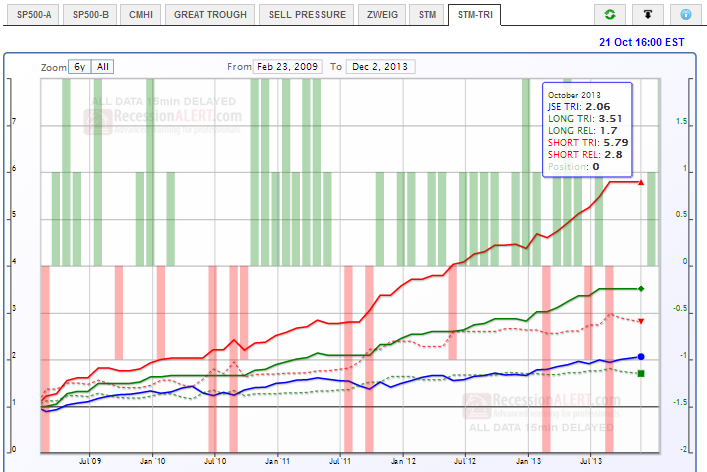 Clicking on the “STM-TRI” tab provides a daily updated performance comparison of the long strategy (STM-L) and the long+short strategy (L+S) versus the SP-500 since January 2009. The red dotted line is the total return index (equity account) of the long+short model divided by that of the SP-500 and the green dotted line is the TRI of the long-only model versus the SP-500. When these dotted lines are rising it means the respective seasonality model is out-performing the SP-500 and when the lines are falling it means the models are under-performing the SP-500. Hovering your mouse over any month will reveal a tool-tip with all the relevant values. As shown below, the tooltip is telling us that as at 21 October 2013, the long-only strategy turned $1 into $3.51 (a 251% gain since January 2009) and it has grown its account to 1.7 times that of the buy-and-hold (“LONG REL”). It is telling us the recommended position for October is “0” or CASH. You can see the SP-500 rose in October whilst both models were in cash and thus the seasonal models UNDER-performed the buy and hold as shown by the falling dotted lines from September to October. We see from the above chart that a “+1” (normal un-levered long) position is recommended for November. In the subscriber version the chart shows up to 6 months in advance. This is very useful as this is a dynamic heuristic seasonal model meaning a position taken on one month is not usually the same position taken for that month every year. If you see a bullish few months , or even if you are lucky enough to see a Power-month coming up the next month, and we are in or have just seemingly rebounded from a reasonably sized (5% or more) correction, then you know you have an even better chance of making a success from the trade. If however the market has run up very strongly during what were supposed to be weak months then you will be more circumspect on the odds offered by upcoming bullish seasonal periods. We are commissioning further research to improve accuracy of the STM signal based on the prior rise or fall of the SP-500 2-3 months before the month being forecast, but for now you must make your own judgments on this matter. Alternatively, just follow the model blindly as done with the back-tests described in this document. Bet half your account on the un-levered months and deploy the full amount on the leveraged Power months. All of the above options are valid for taking advantage of the extra positive statistical outcomes provided by the Power months. There is an undeniable, long term persistent seasonality element inherent in the U.S stock markets. 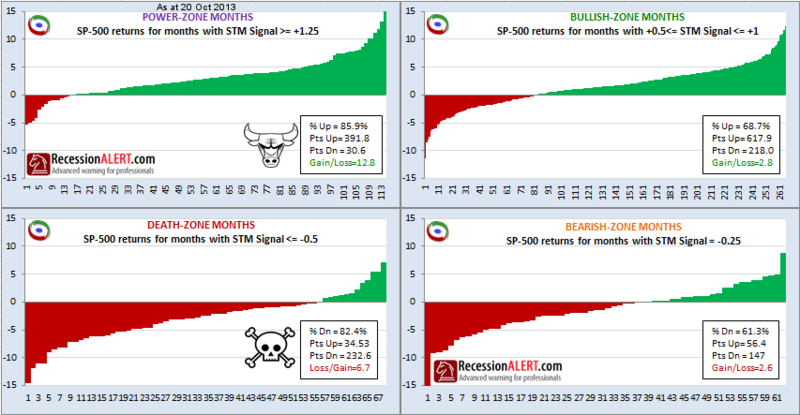 The STM timing model extracts 80% of these seasonal trends to produce a low risk high-reward trading model. We did not include the 2007-2013 period in STM’s repertoire of data for its probability modelling and the performance of the model in the out-of-sample period has exceeded all expectations. However, as with any model, the decisions are based on statistical probabilities taken from past market behavior and seasonal tendencies are not guaranteed to continue persisting into the future, since past returns are no guarantee for future outcomes. However, other than having a true crystal ball that can gaze into the future, probability outcomes are our next best option. We aim to complete further research into the use of the STM in recession forecasting as well as the introduction of the Recession Forecasting Ensemble (RFE) components into the STM trading model to virtually eliminate all the bad trades STM concluded in bear markets. It makes no sense to be trading with STM if the RFE is on high alert for recession for example. This will considerably improve the winning rates for STM. For now, the STM models are offered at no additional cost for current subscribers until we complete at least a year of out-of-sample trades.